On the 21st of August, 2017 I was in Hopkinsville, KY to view the solar eclipse that crossed the United States from Oregon to South Carolina. I made a 25 minute field recording spanning the time before, during, and after the eclipse. That unedited recording is included here, as well as a composition which utilizes the raw recording as source sounds. The edited composition is based on the embellished memory of the whole event. wind in garden bucket, mom & dad’s front porch, mema’s garden, daddy bill’s pond, bugs in the pasture, front porch swing, tomatoe’s tuning forks, neighbor’s bass, synth, flock in bamboo, shade tree bands, big spring park, gravel road, rain at back deck, bankhead, fiddle off, wandering at fiddler’s convention, synth, *, sculpture pipes, frogs in bird sanctuary, train at home, neighbor’s bass, fiddler’s convention, my garden, synth, home, synth, cousins-in-law and their dogs, doyle’s chime, cabinet pots, cooking in canyonlands, home, camp pot, bankhead, attic springs, synth alone in the lab, vacant marble, deer deterrent, attic door, grayson and rascal, home, amanda and the rottweiler, lucy tail, reel to reel, home, charlie, water on grill lid, hole in the wall at fort gaines, drip on lowe mill canopy, box preacher, elevator, summer thunderstorm, shy ukulele, trump preacher, mechanical units, seminole drive, helicopter over magazine room at fort gaines with microphone in wall, rusted bolts on trailor, home, birds in soffit, anchor at dauphin island, water at sink,synth, home, june bugs on mom & dad’s porch, door at library, hole at fort gaines, sparrow nest, bath, home, cricket under deck, lounge band at lumberyard, back door, cicada, pasture gate, lounge band, gate on grass, synth, pasture bugs, synth. The Paseo Recordings began with field recordings of Before (Taos) being played in an alley off the Taos, NM Historic Plaza during The Paseo Project. The Paseo Project is a street art festival in -- you guessed it -- Taos, NM. Before (Taos) is a two hour long sound installation that was a part of that festival. See the Past Work section of this page (below) for more on the installation. The Paseo Recordings is a comprehensive documentation of all of these pieces. The Paseo Recordings picks up where Before (Taos) left off. Both projects seek to establish a strong sense of place, both utilize field recordings in and around Taos, NM. Where Before (Taos) focuses on recordings of natural sounds, The Paseo Recordings place human activity in the foreground. Where Before (Taos) focuses on simplicity, The Paseo Recordings are rich and complex. The Lighthouse has recently taken its first steps with a 10 day trip to the Outer Banks in North Carolina. Its focus and purpose will likely evolve a few times before completion. Currently the focus is broad. It includes the documentation of lighthouses as an outdated architectural form, as a cliché, and a vessel for ideals. The documentation is through phonography, field recording based composition, photography, and fictional memoir. This project will be a series of releases, hopefully starting in 2019. For starters, this is a recording near the Bodie Light in Nag's Head, NC. Of Silence was a joint production from Alrealon Musique, Blondena Music, and Silent Media. 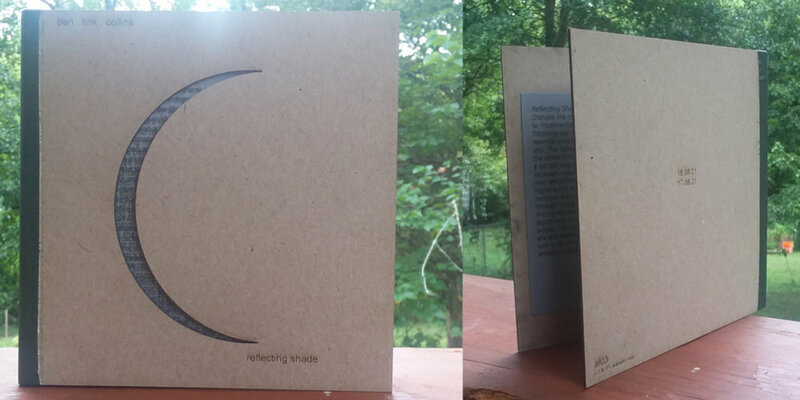 It is a limited edition of 500 handmade card stock cases and CDs. The Paramaount goal of this project was to investigate the role of silence within the work of each artist: Pas Musique, Shaun Sandor, and myself. All three began with their own concepts of silence. Each artist composed an audio piece based on their concept and then passed the completed works on to the next artist in a predetermined rotation -- Pas to Ben, Ben to Shaun, and Shaun to Pas. The following composer then worked on the previous artist's composition with regard to their own concept of silence. This revolution took place twice, resulting in nine full compositions. Before (Taos) is a two hour sound installation commissioned for the 2014 street art festival The Paseo in Taos New Mexico. The installation was composed of field recordings made in Northern New Mexico and Southern Colorado. The project began as an imagining of Taos before it was inhabited by people and how the natural conditions influenced the people and the architecture of the current culture. Recordings of the installation and the festival will be the sound sources for the upcoming release The Paseo Recordings (see the current work section of this site). The Nuances of Wedlock is composed of audio studies conducted for "The Marriage Proposal." "The Marriage Proposal" is a poem by Joel Fry and a respective audio piece by me included as one fifth of another artefact called VISITATIONS. The audio for The Nuances of Wedlock and "The Marriage Proposal" are bowed before, gestured toward, and delivered from recordings of Joel reciting, and Emily Troedson singing the poem. The Nuances of Wedlock is a hand numbered, handmade edition of 50 card stock prints with hemp thread tied to a ringlet fastener, and a cdr. Visitations, a collaboration with the poet Joel Fry, was the second release on Silent Media. The project is a study of ideas and how those ideas break down when distilled into words or sound. Each respective piece of Visitations began differently. For “The Marriage Proposal” the poetry came first and the music was composed based on the ideas represented in the poem. For “The Farm Before Dawn” that method was reversed. Though, in other cases, Joel and Ben’s creative processes were not that direct. Instead, there was an extensive back and forth between the artists to represent an idea in whole through both mediums. For “A Star on The Sea” Joel and Ben began with only a title, working independently at first, and then bringing their works in progress to each other for final touches. Both “Prayer” and “Old Age on Sanders Street” where created less methodically, but with equal focus on the other medium. Though the works on Visitations are the result of two artists working independently within their own means of expression, a broader consciousness was imposed on Ben and Joel’s processes in the sense that they were never alone, never permitted to create in a vacuum, never without a definable sense of an other in both human and creative forms. MY NAME IS BEN LINK COLLINS AND ALABAMA FIELD IS THE HOME FOR MY WORK AND COLLABORATIONS. SO FAR THAT WORK HAS CONSISTED OF SOUND ART, PHOTOGRAPHY, GRAPHIC DESIGN, AND ARCHITECTURE. I GRAVITATE TOWARD ARTIFACT BASED INTERDISCIPLINARY PROJECTS. FROM 2012 TO 2015 I WAS THE DRIVING FORCE BEHIND SILENT MEDIA, AN INTERDISCIPLINARY, ARTIFACT BASED RECORD LABEL THAT IS NO LONGER ACTIVE. YOU CAN STILL FIND ALL OF THE SILENT MEDIA RELEASES ON THE SILENT MEDIA BANDCAMP PAGE. The ALABAMA FIELD BANDCAMP PAGE IS HERE.